Summer blockbuster season is over. Film festival season has begun. But Oscar contenders (and this year there are many) haven't exactly started to filter out of the festivals and into general release just yet. In the meantime, studios are padding out their schedule with their second-tier product. Two films opening today in Atlanta fall into this middle ground. Not quite potential cash cows or destined for critical acclaim, each is a niche movie designed to appeal either to males or females but probably not both. Austenland is about an obsessive Jane Austen fangirl who has the opportunity to visit the immersive Austen getaway whose name gives the film its title. 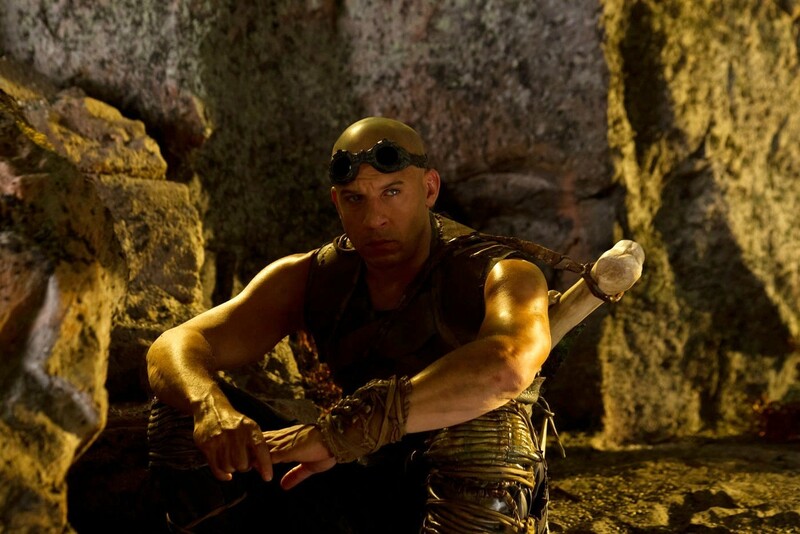 Riddick is the third entry in the Vin Diesel science fiction franchise created by writer-director David Twohy. One is a fairly original story with potential for unique greatness. The other is built on a hackneyed plot offering few surprises. Which do you think is the more successful of the two? Read on... it's probably not the one you'd expect. If you had asked me before I saw either of them, chick-lit-flick Austenland would have struck me as better positioned to succeed. Keri Russell plays Jane Hayes, the equivalent of what a Trekkie is to Star Trek, a benign Jane Austen fan fixated on meeting her own Mr. Darcy. Her apartment is loaded with kitschy knick-knacks evoking Pride and Prejudice and other Austen novels, including a life-size standup poster of Colin Firth as Darcy that has suffered some abuse at the hands of jealous boyfriends. Jane jumps at the opportunity to visit Austenland, a bizarre paean to the author and her books run by Mrs. Wattlesbrook (Jane Seymour). Only Jane is on a budget, as Wattlesbrook takes every opportunity to remind her (the alias assigned to Jane is Miss Erstwhile), putting her up in the estate's maid quarters while another more affluent guest (Jennifer Coolidge) gets a lavish bedroom. Directed by Jerusha Hess (wife of Napoleon Dynamite director Jared Hess), the movie repeatedly places Jane in situations that underline how dull and unfair the class-obsessed world era Austen lived in really was, how it would have steamrolled an unremarkable introvert like herself. Jane even begins to question whether she really would go for a stiff like Darcy, in the form of Wattlesbrook's pedantic nephew Henry Nobley (J.J. Field), or a more colorful stable boy named Martin (Flight of the Conchords' Bret McKenzie). For a comedy with ample opportunity to mine the situation for fish-out-of-water humor or laughs derived from anachronisms the biggest problem with Austenland is the fact that it just isn't funny, save for one scene where Jane is asked to entertain on the harpsichord and the only song she knows how to play is "Hot in Herre." Hess probably realized this just like the rest of us since an extended performance of Nelly's song featuring the entire cast in period dress runs over the end credits. Otherwise, confounding choices are made in the way Austenland is edited so that even good jokes are ruined by a noticeable lack of comic timing. The sound editing is a muddle throughout, especially when more than one character is speaking or stepping on another's lines. And Feild's pivotal Nobley character seems to be playing in another more serious film than Austenland, which was likely Hess's intentional direction to the not untalented actor but ultimately only adds to the feeling that the film doesn't really know what it wants to be, parody, tribute, romantic comedy or goofy social commentary. 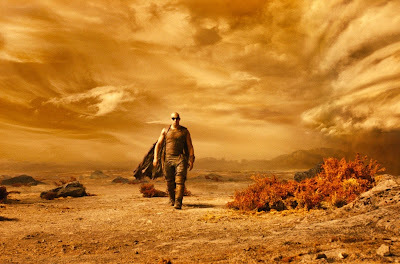 On the other hand, Riddick looks like a perfect slam-dunk for most imitative sci-fi yarn of the decade, which I don't necessarily disagree with. It's what director Twohy does with the foundation of quotes he builds on that impresses. After the gigantic misstep of the bloated Dune rip-off The Chronicles of Riddick, Twohy strips down both Richard B. Riddick (Diesel) and his interplanetary backdrop in an amazing half-hour opening act that could play as a movie of its own. Save for minimal voiceover by Diesel, this prologue follows Riddick, stranded on a pronouncedly inhospitable world as he tries to get his mojo back, raising one of the wild dingo-like alien animals as a loyal pet, excruciatingly setting his broken leg in the most painful way possible, and eventually battling a venomous scorpion-like creature that sticks to water. That last part becomes a problem in the movie's final act when the mother of all rainstorms brings a slew of those monsters out of the woodwork. Between the opener and the conclusion comes an extended middle act where Riddick lures not one but two squads of mercs (one led by Jordi Molla, the other by Matt Nable) to the planet in order to escape on one of their ships. It is this middle act that is the most problematic and predictable. But then again, one doesn't go to see a Diesel movie expecting originality. Riddick's rewards are found in the small surprises that arise whenever Twohy deviates from pattern... plenty of times as it turns out. For instance, I was surprised that the interstellar fugitive (who takes pride in the fact that his rap sheet now says "Bounty doubled if returned dead") doesn't predictably try to play the two rival bounty hunters against each other the way Clint Eastwood's Man with no Name did in A Fistful of Dollars. Or that when Riddick actually confronts one of the meanest of the mercs (Bokeem Woodbine), the man admits he's scared of Riddick and is left alive to tell the tale. Riddled with small curveballs like these, Riddick comes into its own fairly early, becoming a back-to-basics mirror of its antecedent, Pitch Black, where Diesel's character, finally turns the tables on his pursuers to become the hunter himself.